"Just breathe!" In the first week of district conventions, I have said this more times than I can count on 10 fingers. It's quite ironic since last year I would have been the one pacing in the hallway about to pass out. In the past two week, districts 5, 7, 4, 9, and 11 have all ran successful contests. Contestants, advisors, and district officers alike might be thinking "Pff easy for you to say!" But no need to plead the fifth here! I speak the truth. Answer these questions: Did a couple contests run long or off schedule? Did your judges leave comments on your score sheets? Did you and/or those in attendance enjoy their time catching up with old friends or make new ones? Were you exhausted by the end of the night? If you answered yes to any of these questions, you were a vital part of a successful contest! Why? Well if you were at a convention where a contest ran over, be thankful for thorough judges. Be thankful that, even if a contestant was late or some other circumstance caused the contest to get off schedule, all entered contests got the opportunity to present the material they had worked so hard to prepare. If your scorecard looks like a judges ink pen exploded all over it, be thankful for the advice because trial and error is how we grow! The fact that you competed puts you leaps and bounds ahead of the person who stayed at home, no matter where you placed. 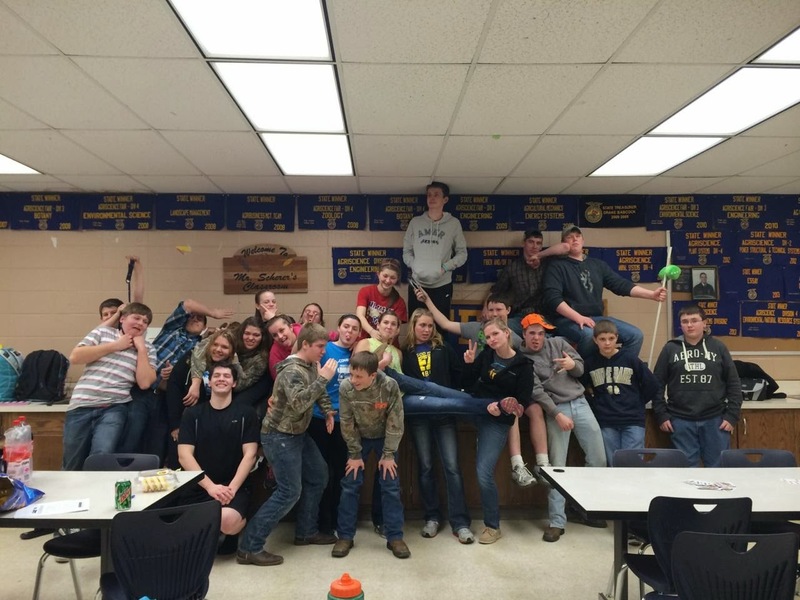 FFA: Food, Friends, and Agriculture. We all know it's true. If you had the opportunity to mix and mingle with those attendance, you were at a successful contest! If you were more than ready to go to bed after convention was over, then you did something right. Maybe it's because you stayed up all night finishing your project like Aaron and Caleb from McCutcheon. Maybe you spent the whole day walking back and forth down a 1/4 mile hallway to make sure all the rooms were ready like Kelly from Riverton Park. No matter what your convention prep story is, if you gave it your all physically and mentally, you were a piece of a successful contest. What determines a successful contest is not who walks away with plaques. It is what happened leading up to that first gavel tap and what happened before the last one. I've been there. 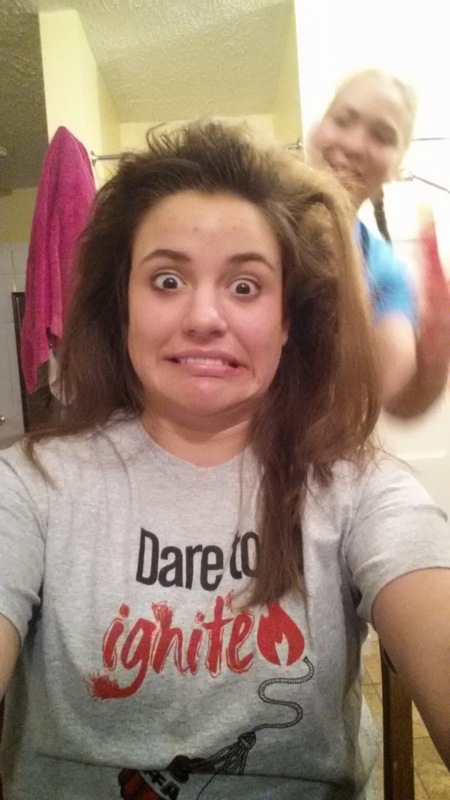 I know district convention causes advisors to wrinkle, parents to gray, and students to pull their hair out. But, even so, take advice from one with experience, one who has had total freak out moments, one who read the same Farm World articles multiple times to glean as much information as possible from them, one who turned every quiz bowl question in a Powerpoint slide so her team could practice: Just breathe. Remember, your brain needs oxygen to function. As many of the followers of the Indiana FFA may know the week of February 15-22, my teammates and I celebrated National FFA Week. 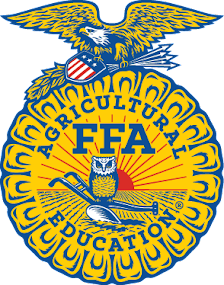 As we prepared for FFA week I spent a lot of time reminiscing on all of the great memories that I had made during FFA Week throughout high school. My high school FFA Weeks were some of the best weeks I had during high school and I was so excited that I had the chance to spend another year celebrating as a member. 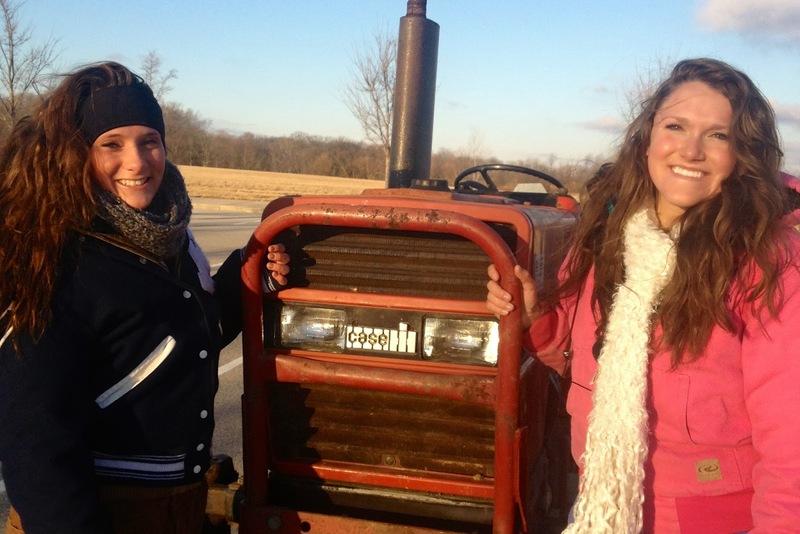 One of my favorite FFA week activities in high school was Tractor Day. My senior year my great friend, Harlee and I rode my Dad's cab-less Case IH Tractor to school on one of the coldest winter days… I still remember jamming to Florida Georgia Line's famous song 'Cruise'! Harlee and I after we made it to the school my senior FFA week! 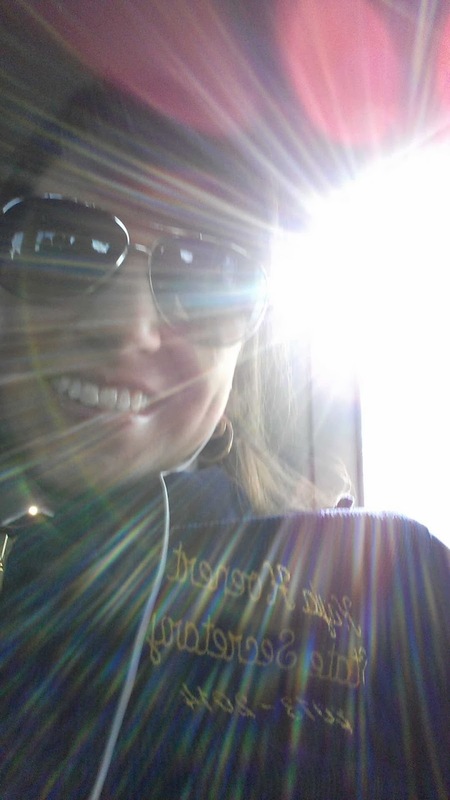 I was blessed to spend National FFA week in Northeast, Indiana within some of District II, III, and VI. Not having any idea of what to expect, my schedule quickly filled with speaking engagements, classroom sessions, and various activities that chapters were hosting. At the beginning of FFA week, I was honored to introduce Governor Mike Pence at the Indiana Leadership Prayer Breakfast! It is so hard to select my favorite memory from such a fantastic week. 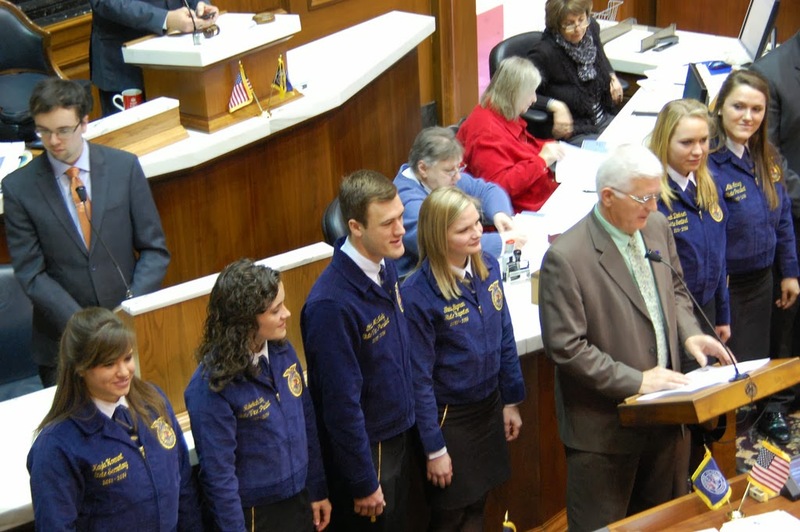 Throughout this blog find pictures and quotes from the Indiana FFA State Officers with highlights from our National FFA Week experience. 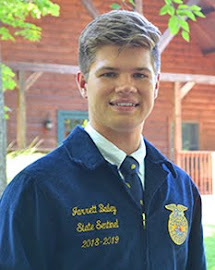 Ethan McNeely the State Southern Region Vice-President said that "the Monday of FFA week was absolutely amazing for me! We met at the Indiana State Department of Agriculture with its new director, Ted McKinney, and other ISDA staff before meeting with Lt. Governor Sue Ellspermann. While in the Lt. Governor’s office, we discussed our upcoming project based on promoting agricultural education as STEM: Science, Technology, Engineering, and Math. Afterward, we had a luncheon with ISDA staff and some of the Lieutenant Governor’s Cabinet. Throughout we mingled, and interviewed with Hoosier Ag Today. At the time, I had no idea my interview on the Lt. 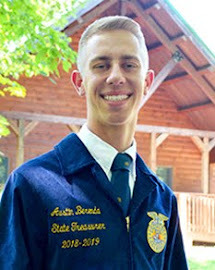 Governor and State Officer Project would end up being shared on Facebook by Dr. Marcos Fernandez, Associate Dean and Director of Academic Programs at Purdue University. It was so exciting to see our work to advocate for agricultural education at the state house beginning to spread amongst others!" 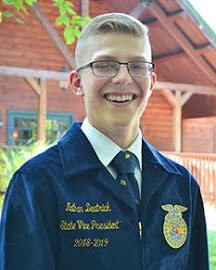 Ethan spent his FFA Week in Central Indiana. Shelby with the Tri-County FFA Chapter for Euchre Night! 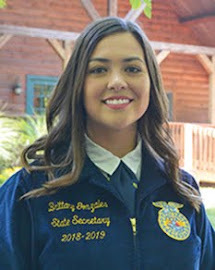 Shelby Sigman the Indiana FFA State Reporter spent her FFA week in District I and parts of District II. Amongst spending the week in Northern Indiana, Shelby participated in numerous chapter events. 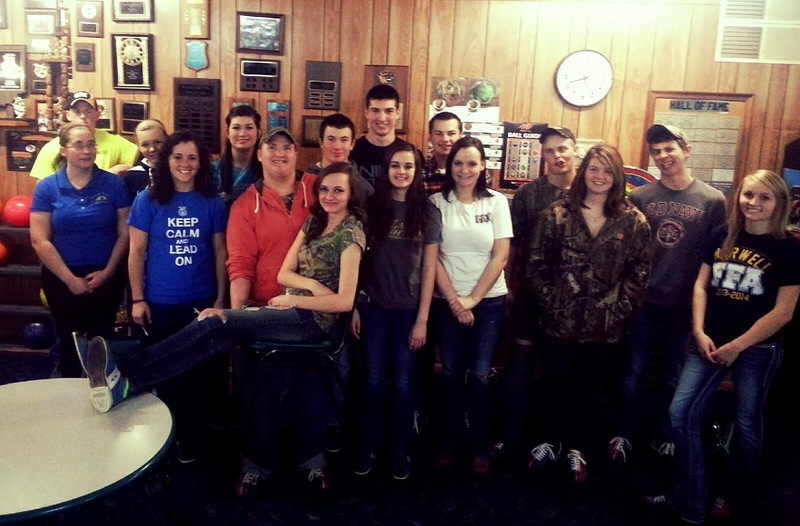 Shelby and I were even fortunate enough to go skiing with the Tri-County FFA chapter on Saturday of FFA Week. 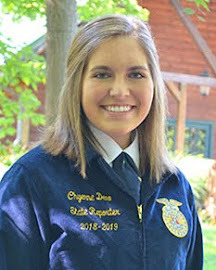 Rebekah Frey the Indiana FFA State Northern Region Vice-President's FFA week was spent in District V and VI. 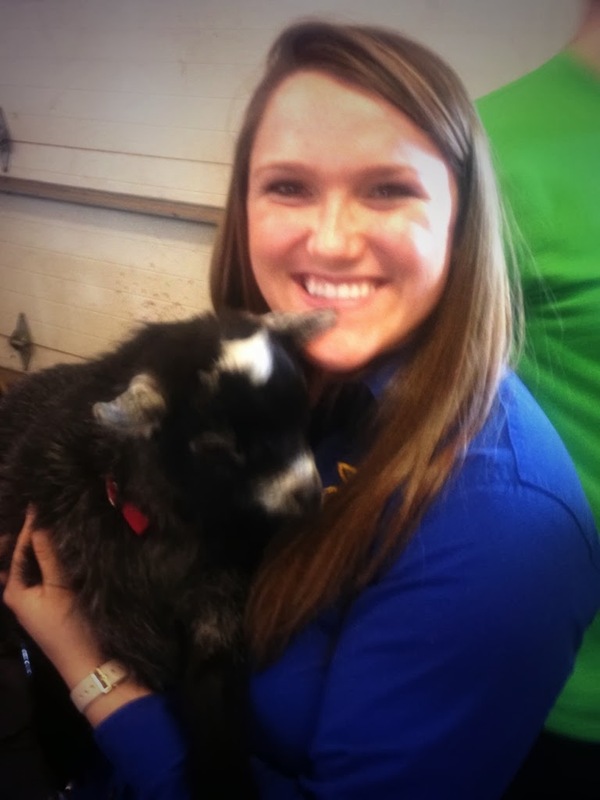 Rebekah stayed busy facilitating chapter visits, petting zoos, and various planned FFA activities at many schools in central and northern Indiana. 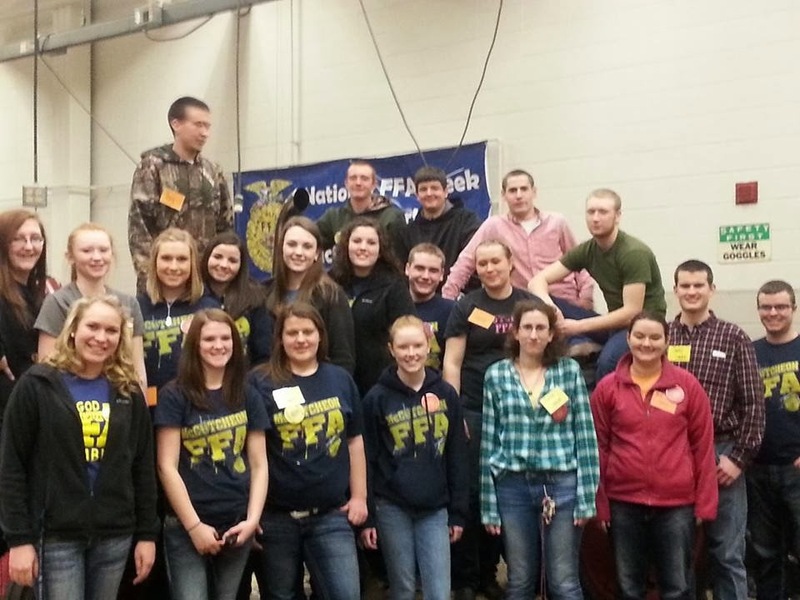 Rebekah bowling with the Norwell FFA Chapter! 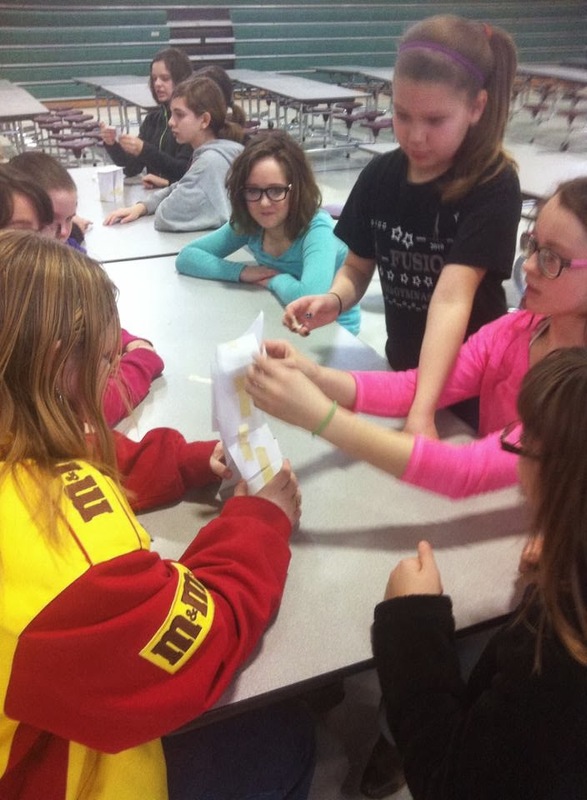 FFA Week was the first time our team had been completely on our own to travel from school to school and to present classroom curriculum. Thankfully chapter visits and district kick-offs which we did in pairs in the fall were good practice in preparation for a very busy but amazing FFA Week for the Indiana FFA State Officer team. 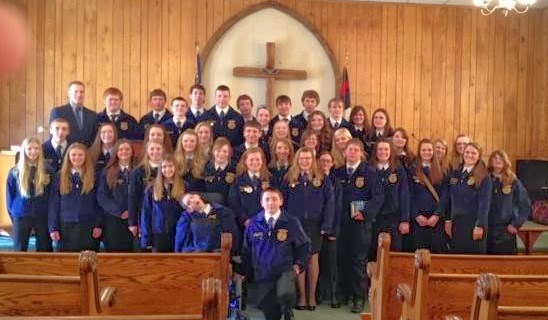 Kayla spent her FFA week in Districts XII and most of District XI. 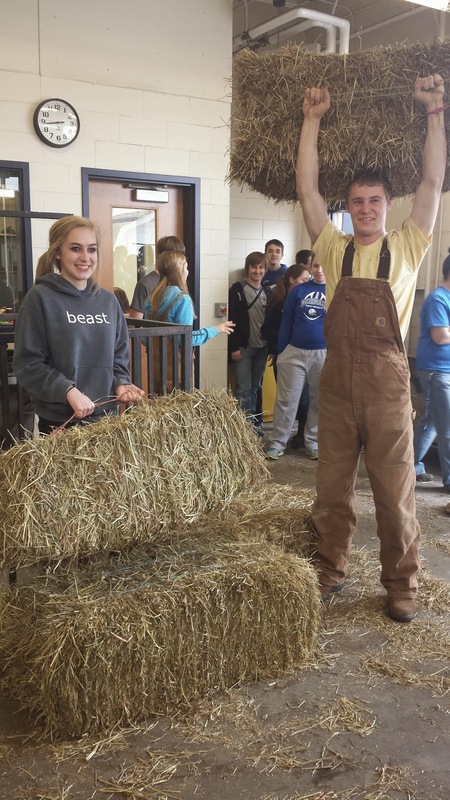 The pictures and captions below are from Kayla's National FFA Week! 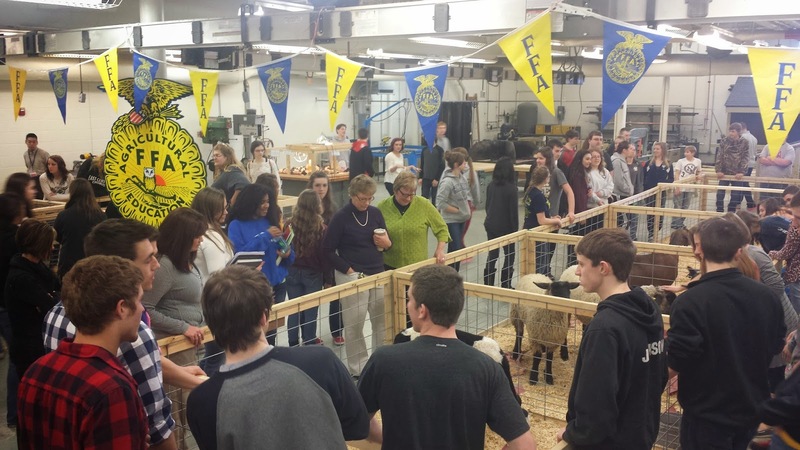 District X hosted Cameron during FFA week! 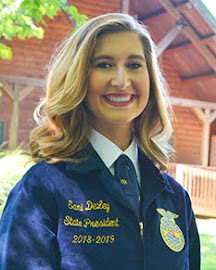 Sarah spent her FFA week in Districts IV and VII! 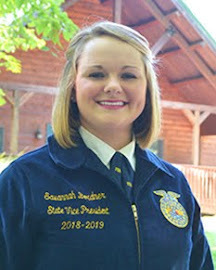 Below Sarah shares her favorite FFA memory. 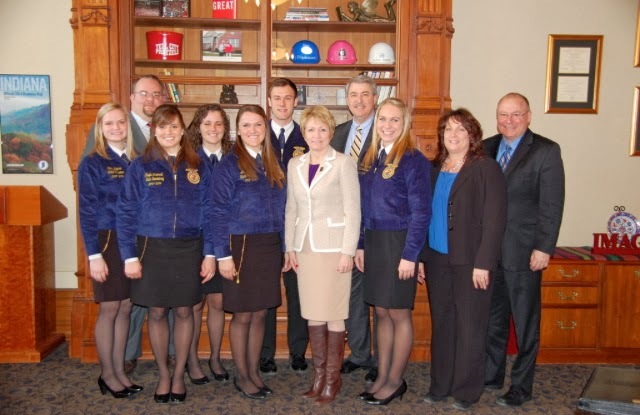 It was great spending a week traveling across the State visiting with passionate Indiana FFA members. I was thoroughly impressed by all of the FFA week events that I went to, it was evident that our members bleed blue and gold. My FFA Week came to an end by partaking in a long time tradition with the North Miami FFA Chapter... church, lunch at Pizza Hut, and laser tagging! It was a great way to reflect, unwind, and have a great deal of fun before heading south to head back to the Indiana FFA Leadership Center. Attending church with over 45 North Miami FFA members. My teammates and I collectively visited over 75 Indiana FFA Chapters and traveled 6,888 miles throughout the state. FFA week was one of the best weeks of my life and I am truly thankful that I had the opportunity to spend it with Indiana FFA members in Northeast Indiana!